Blacksmiths made and repaired metal items used in the home, in factories and on the farm. Many blacksmiths also shoed horses so their shops were a place where men met and exchanged local news. 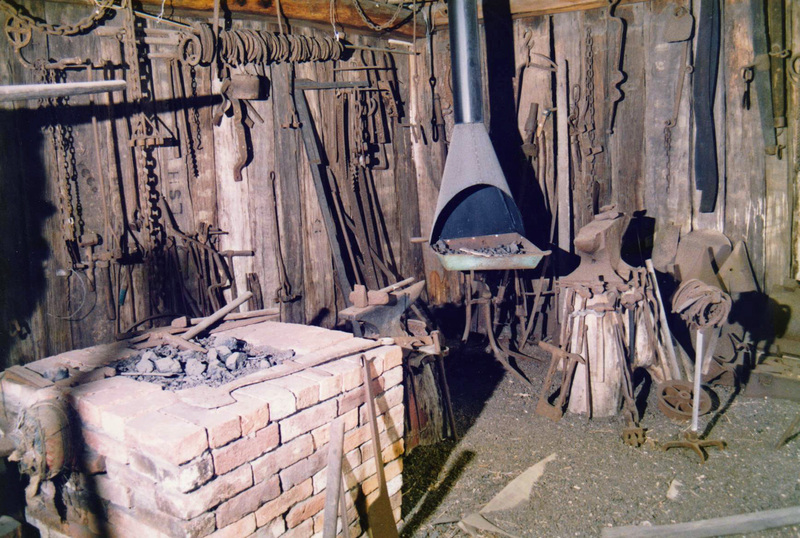 The blacksmith's shop at the Museum was built by Ken Thomas who had been a blacksmith at Albion Park. The timber for the building came from the Denniss family home, Gardena Cottage, at Marshall Mount when it was demolished. The centre pieces of a blacksmith's workshop were the forge and the anvil. The forge was fired using coal, coke or charcoal and could burn at a very high temperature by blowing air into the base of the fire using bellows. A piece of metal was heated in the forge and then carried to the anvil using a pair of tongs. At the anvil, the blacksmith hammered the hot metal into whatever shape was required. The metal was dipped into water after hammering. The Museum's blacksmith shop has a a brick forge as well as a smaller metal forge and chimney and a small travelling forge. Sulkies were the sports cars of horse drawn vehicles. They were drawn by a single horse, had a padded seat for two people, two wheels and were sprung to minimise the effects of bumpy roads. This sulky was made in Wollongong by Commens and Tuckey and is a fine example of coach making. The company operated from Keira St, Wollongong between 1913 and 1926. Every farm had one or more carts for transporting produce to market or around the farm. This cart was owned by the Stewart Brothers who operated a dairy farm at Minnamurra. They used the cart to take the milk cans to and from the milk factory at Kiama. The cart has a board seat and was pulled by one horse usually a light draft horse. It wasn't built for comfort although for many poorer farmers, it was also to transport their families. The parents sat on the board ad the children sat in the back.